Distance from Vortex in Rotor Diameters. This averaged distribution closely resembles the Gaussian curve. This heightened resemblance occurs because diffusion acts to spread the vorticity distribution into a Gaussian. When you average out the effect of diffusion, it does not cancel out, because it acts similarly everywhere. The other force that affects vorticity distribution, however, does acts differently at different places. This force regards the interactions between vortices. It depends on many parameters, such as the distance between vortices. Since this force depends on many different parameters, it can act in opposite ways at different places; thus, averaging can cancel its effect out. That is why the averaged vorticity distribution is more Gaussian than the distribution across a single line. A Gaussian curve is a good first approximation to the vorticity distribution, because the diffusion systematically brings the vorticity towards a Gaussian curve. This approximation can be utilized in multiple ways. Outside of wind energy, many mathematical studies have researched how Gaussian vorticity distributions evolve in time. They have found that the time it takes for vortices to merge together depends on the vorticity distribution. 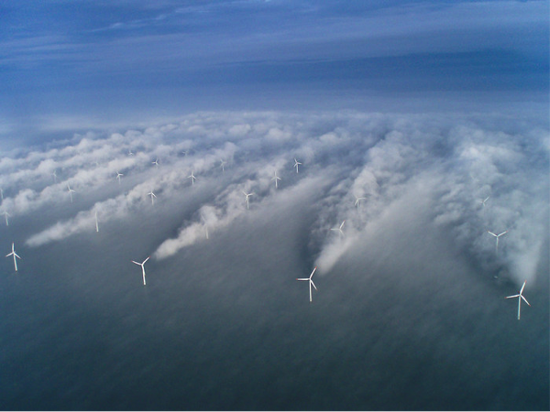 If the wind turbine’s vortices are Gaussian, then we can use results from these studies to more effectively learn how the vortices evolve. Knowledge on vortex evolution can be used to limit the detrimental effects of vortices on wind turbines. Additionally, numerical simulations may be able to utilize Gaussian approximations in order to more efficiently study how vortices evolve. Current simulations track millions of grid points, which take a lot of computation. Instead, simulations might improve efficiencies by just tracking a relatively small number of vortices. Research upon vorticity distributions can illuminate characteristics of vortex merging, which, in turn, can be used to innovate wind farms.